I was in the mood for a little stir-fry this week but I've had so much chicken, I needed something different. 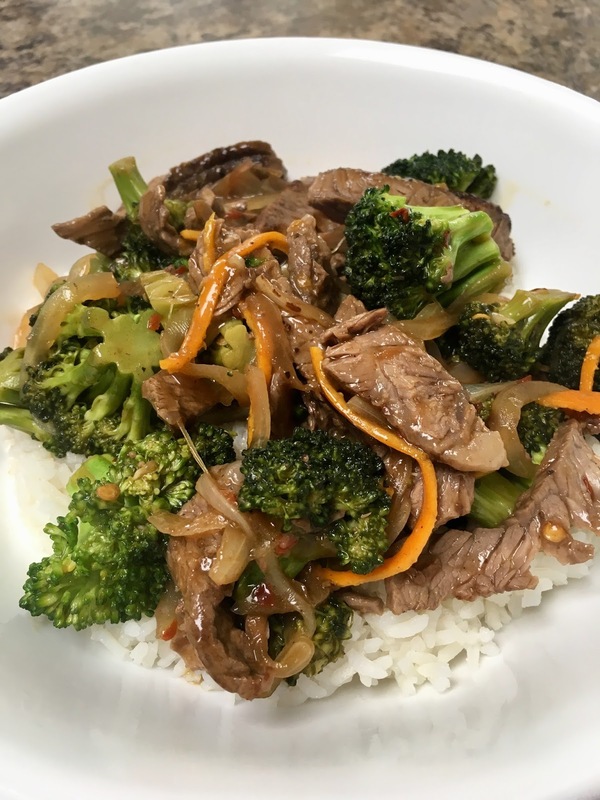 Beef and broccoli sounded good so I searched the internet and found this recipe for Five-Spice Orange Beef and Broccoli. It was super easy and reallly delicious. Since it was a last-minute idea, I didn't have a few of the ingredients - beef stock, hoisin sauce, rice vinegar, green onions, sesame seeds - but that didn't affect the meal. I used chicken stock in place of the beef, 2 tablespoons of sugar and white wine to make up for the hoisin and rice vinegar (since hoisin is a sweet and rice vinegar is sweeter than white vinegar). As for the green onions and sesame seeds, they're just garnish and I can do without them. Next, there are just three steps to put it all together! Sprinkle steak evenly with five-spice powder, black pepper, and salt. Heat a large wok or skillet over high heat. Add 1 tablespoon oil to pan; swirl to coat.Add steak; cook 4 minutes on each side or until browned. Remove steak from pan; let stand 5 minutes. Cut steak across the grain into thin slices. Return pan to high heat. Add remaining 1 tablespoon oil; swirl. Add broccoli, onion, rind, and garlic; stir-fry 3 minutes or until lightly browned. Combine stock and next 6 ingredients (through red pepper) in a bowl, stirring with a whisk. Add stock mixture to pan; cook 1 minute or until slightly thickened. 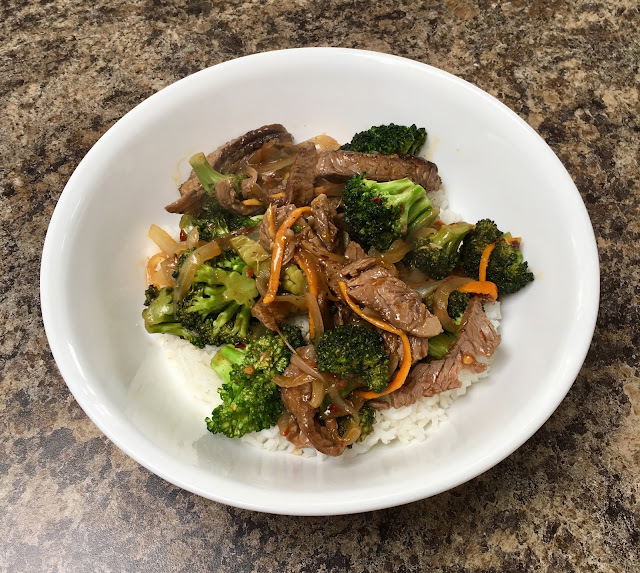 Spoon 1/2 cup rice onto each of 4 plates; top each serving with 3/4 cup broccoli mixture and 3 ounces beef. Sprinkle evenly with green onions and sesame seeds. I didn't do the broccoli and beef separately, I mixed the meat in with the broccoli before I served it. I wanted everything coated with the sauce. I will definitely be making this again. In fact, I'm kinda craving it right now. Also - I was surprised at how delicious the orange rinds were. I used Cuties because I had them on hand and they were perfect.